Fall means apples, and at the farmers’ market on Saturday, apples began their fall glory. My favorite apple stand had flame streaked Braeburns and dusty rose Cameos. The Mutsus and Orins sported jaunty golden shoulders over their green bellies. As I methodically chose apples to bring home to my apple-loving man, a sharp tug startled me. I yelped, turned, and found my friend RWW, who smiled and asked me about my apple choices. After I explained what I had chosen to purchase and why, I asked him and his wife if they’d like to wander through the market with me. As we walked from stand to stand, RWW told me about how busy he’d been with his classes for his Masters in Landscape Architecture. He’s taking as many classes as he can so that he can start his career as soon as possible. He told me that he’d struggled with maintaining his home, yard, and everyday responsibilities as he put in the time and attention his projects needed for the type of results he wanted. I can relate. Every year the same thing happens to me. I love my job more than I ever knew I could—my students enchant me with their curiosity and humor. They make me think, laugh, cry with pride, and spend hours poring over their writing. The parts of me that make me a teacher are some of my best parts, but every year, when the schoolyear starts, the other parts of me disappear. First, I lose any ability to clean my house. Then, I stop spending much time in the pottery studio, and most of what I end up producing is C-R-A-P. I stop reading anything other than texts that I’m teaching or that help me teach. I fall behind on laundry, forget to water my plants, neglect my friends, neglect my always-too-slender relationship with God, and even, if I’m so busy I can hardly breathe, lose my desire to cook. 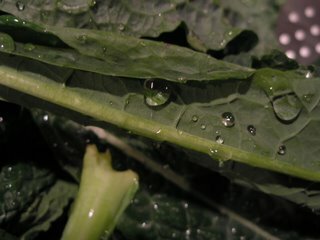 On Saturday, after poking through the stand where I often buy my green vegetables, I chose a black-green bunch of kale. I showed it to RWW who asked me how I cooked it. When I told him, his eyebrows first rose with excitement, but nearly immediately fell again. He sighed. I nodded. Heaven knows I understand the feeling. His unhappy face flashed resolution. “Screw it. I’m getting some too. I’ll find some time to cook it this week.” Despite his wife’s doubtful wrinkles in her forehead, he went ahead and purchased the bunch of kale. I came home tonight to an empty house (ECG’s on an out-of-town job interview) and knew that what I wanted more than anything was that green kale waiting for me in the crisper. I took it out, rinsed it off, and celebrated the way the water holds its silver spheres on the green waves of each leaf. I thought about RWW and hoped he had the time this week to enjoy the same thing. RWW, I made this tonight while thinking of you, hoping that this week gives you the chance to breathe, sleep, and do something great with that beautiful bunch of kale. Set a medium pot full of salted water on the stove over high heat. As the water is coming to a boil, wash the kale well in a colander. After cleaning, strip the large stem out of the center of each leaf. This is easy and fun to do: grab the stem with your right hand, and place your left thumb and forefinger on either side of the stem. With some force, squeeze and pull down at the same time. You should be able to unzip the leaves from their stems. Pile the leaves on a cutting board and roughly chop. By this time, the water should be close to a boil. Once it boils, drop in the kale. Give the kale a bit of time to blanch, no more than two minutes. If you start to smell the distinctive sulfuric cabbagey scent, you are on the edge of overcooking. 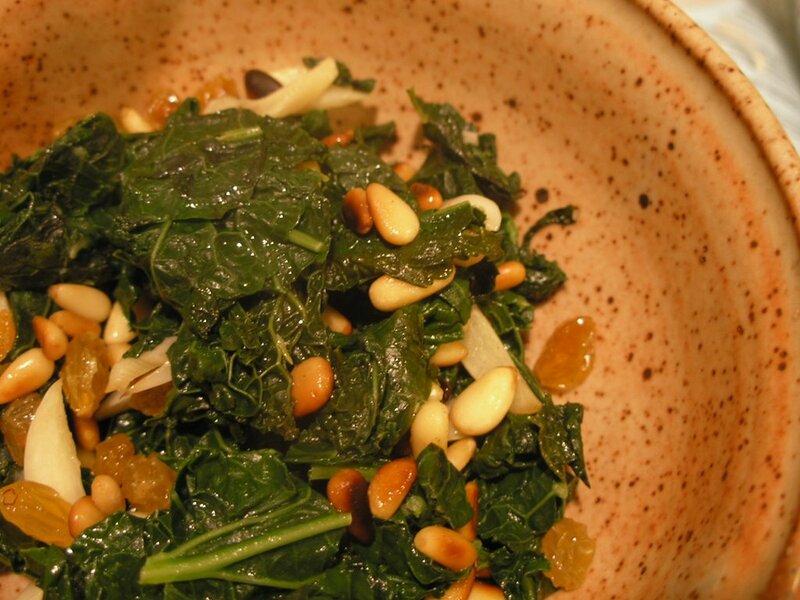 Remove the kale from the heat, drain through your colander. Let the kale sit in the sink to drain more as you begin the next step. Drizzle a tablespoon or so of olive oil into your frying pan. Once the oil heats to the point wear it easily coats the bottom of the pan, drop in your garlic. Sauté until just golden. 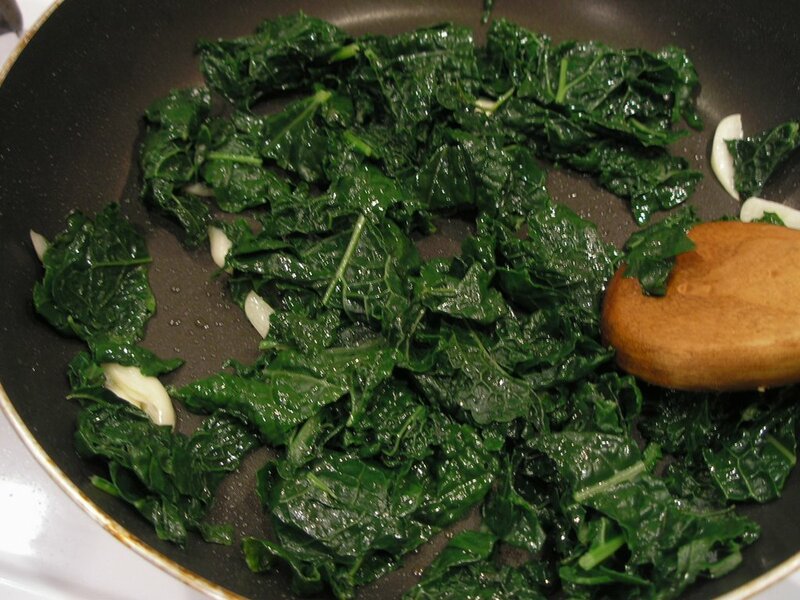 Take the kale from your sink, and dump the colander into your frying pan. It will sputter and jump with the moisture left on its leaves. Move the kale around continuously, stir frying as the remnants of water disappear with the heat. As soon as the remaining water disappears completely, toss in the toasted pine nuts and raisins. Remove from the heat, add a splash of red wine vinegar and stir to incorporate it, then spinkle a crunchy shake of sea salt over all. This serves one greens-loving busy person. You're welcome, man. I'm glad you enjoyed it.